The way that I’m constructing the book is to start each major section with an “Essence” chapter, then an “Anatomy” chapter. The first gives a general spiritual orientation, then the following dives into the prayer book, identifies where the parts are to be found, and offers a more particular discussion of what we find there, drawing on both the general principles and the actual contents. Since we’ve talked about the essence of the Calendar and identified some central spiritual principles (as in part 1, part 2a, and part 2b), it’s time to turn to the prayer book contents. The Calendar is most clearly laid out in a section at the head of the Book of Common Prayer. After this initial material, several other parts relate back to it and assume its patterns. In particular, the Collects, the rites provided for special days, and the lectionaries depend upon the shape of the year laid down in the Calendar. So, the first few pages of this Calendar section lay out the liturgical rules governing the various days of the year. These provide general rubrics for how to figure out what occasion to celebrate on any given day. Next, we have a section that lays out the months from January to December and identifies which fixed feasts fall on which days. Last, we have a list of titles that specify how we name the various liturgical occasions of the year. For the most part, this section does a good job of letting you know how to order your services, but there are a few oddities worth noting that effect both how we order things and how we understand the wider year. First, the normative unit of time throughout this section is the day with the consequence that seasons are given short shrift. Notice—there is no section here that talks about seasons of the Church Year. That’s not to say they are absent; the names of the seasons are mentioned throughout the Calendar section and they are used as structuring devices in the listing of the titles on pages 31-3. However, they are assumed rather than explained. Indeed, many people assume that the colors of the liturgical seasons and the practices around them are listed out somewhere. There are plenty of such lists—but none of them appear in the prayer book! 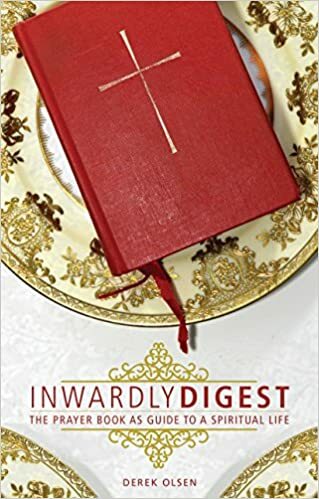 There is much in this section that seems fairly arcane—like the specific rules for determining the date of Easter—but there are also some nuggets in here that will help you if you have any sort of planning to do that involves the Church Calendar. The Table to find Easter Day is a straight-forward list: you look up the year, and it tells you the month and day Easter falls upon and whether it’s a leap year or not. Once you have that, you can turn the page, and look up that month and day in the next table, the Table to Find Movable Feasts, and it’ll provide the number of Sundays after Epiphany, the month and days for Ash Wednesday, Ascension Day, and Pentecost, the Numbered Proper that the Sunday after Trinity Sunday will start with, and the month and Day of the First Sunday of Advent. The other thing that’s in here is an explanation of the funny letters and numbers listed in the monthly tables back on pages 19-30. If you look at page 22—the month of April—you’ll see four columns going across the page. The first only appears sporadically and gives a number. This is the Golden Number related to finding Easter Day—feel free to ignore it. The second gives the days of the month. The third is a repeating string of letters going from A to g; these are the Sunday Letters and this column can be handy if you want to know what Holy Days may fall on a Sunday in a particular year. By finding the letter of the current year on the table at the top of page 881, you can learn which letter will represent the Sundays throughout the year. The fourth column, of course, gives the title of the occasion with Feasts in bold type and Optional Days in regular type. The Sunday collect gets used throughout the rest of the week unless there’s a Holy Day. “The Collect for any Sunday or other Feast may be used at the evening service of the day before” (BCP, 158). Then, a variety of notes get tucked between the collects! There are three kinds of notes here: 1) notes that identify when certain optional movable days occur, 2) notes that give additional directions on how to handle a tricky part of the Calendar, and 3) notes that direct you to other services within the book. The Calendar section mentions the Rogation Days and the Ember Days but never explains what they are or when they fall; while the “what” never does get explained, the “when” is provided by italicized notes like the one on page 160 following the collect for the Third Sunday of Advent: “Wednesday, Friday, and Saturday of this week are the traditional winter Ember Days” (BCP, 160). The next page (page 161) gives an example of the second kind of procedural notes: the italics on both sides of the title for the First Sunday after Christmas provide more detailed instructions for how to negotiate the three Holy Days that fall after Christmas and what to do if a Sunday lands on one of them. All of this sounds awfully confusing. The reason is because there is no piece dedicated to tying it all together. Allusions and references are made to a wide variety of concepts around the Calendar, but these references assume a big picture sense of the whole that the prayer book never actually provides. In order to understand what the mechanics are and how the mechanics then flow into our spirituality, we need to take the time to construct the big picture view that is implied but never stated explicitly. This entry was posted in Church Year, Spirituality and tagged Prayer Book Spirituality Project on September 27, 2013 by Derek A. Olsen. To join the linkup, simple visit the Episcopalian Bloggers page on my blog @ http://www.thejonesesblog.com/2013/09/episcopalian-bloggers.html, retrieve the badge code, and add your blog’s information to the linkup. If you have any questions or concern, please contact me. I would love to have you join us! I reply: a) March has lunar numbers too. b) We may be free to ignore the lunar numbers, but why should we? If we all do so, we lose our ability to verify the Easter computation. But besides that, if God make the moon to mark the times, and if we are using the moon for that very purpose in our Easter computation, and if the moon is one of the fairest things God has put in our night sky, then maybe we should pay more attention to our church’s lunar calendar, not less. Of old in the office of Prime (as you well know), the next day’s solar and lunar dates were announced at the reading of the martyrology. Maybe we should sometimes use this custom again.